The Senate in Mississippi passed a bill on March 29 that would allow armed guards at churches. 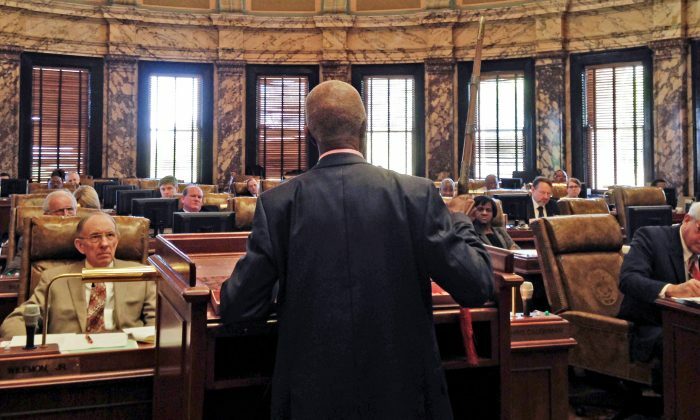 The state’s senators voted 36-14 in favor of House Bill 786, known as the Mississippi Church Protection Act. The bill was sent to governor Gov. Phil Bryant (R-Miss.). The new bill would allow churches to designate members to go through firearms training and to carry guns for protection. However, the law expands beyond security for houses of worship. It would also permit residents to carry guns in holsters without a state concealed weapons permit, which sparked criticism, especially from the Mississippi Association of Chiefs of Police. The association’s executive director Ken Winter said the new bill would make it more difficult to stop individuals who are suspected of wrongdoing, and said the “threat level” to officers will be raised. “We just don’t believe that it’s a good idea for people to be carrying concealed weapons and not have participated in any training,” Winter said. The bill also declares that no state official can enforce any federal executive action or administrative rule that violates the constitutions of Mississippi or the nation, challenging the principle that federal law overrides state law. Some church officials praised the new bill. “The reality is that we’re a soft target,” Larry Dean, pastor of the Bridgetown Baptist Church in Nesbit, Mississippi, told The Daily Beast. Meanwhile, others opposed it referencing Jesus and Christian scriptures. We don’t need to pimp the church for political purposes. Sen. Hillman Frazier (D-Miss.) spoke against the bill while waving a sheathed sword before the chamber. He referenced the biblical story of when Jesus, while he was being arrested, healed a high priest’s servant after the disciple Peter cut off the servant’s ear. “We don’t need to pimp the church for political purposes,” Frazier said. “If you want to pass a bill liberalizing gun laws, then do that. Don’t use the church,” he added. The Mississippi chapter of Moms Demand Action for Gun Sense in America released a statement against the bill after it was voted in favor by senators. “Today’s vote is a dangerous setback for our state that dismantles the concealed carry permitting system that has helped to keep Mississippians safe for years,” said Shirley Hopkins Davis, volunteer Chapter Leader of Mississippi Moms Demand Action. He also said security at houses of worship are necessary, especially after last year’s mass shooting at a church in Charleston, South Carolina where nine people were killed.